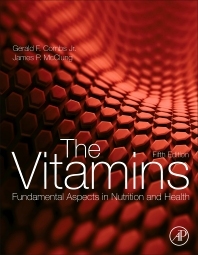 The Vitamins: Fundamental Aspects in Nutrition and Health, Fifth Edition, provides the latest coverage of the biochemistry and physiology of vitamins and vitamin-like substances. Health-related themes present insights into the use of vitamins, not only for general nutritional balance, but also as a factor in the prevention and/or treatment of specific health issues, such as overall immunity, inflammatory diseases, obesity, and anemia. Readers will gain an understanding of the roles vitamins play in gene expression and epigenetics, providing important information on the further development of personalized medical treatments that will also allow them to establish appropriate dietary programs based on individual genetic profiles. This cohesive, well-organized presentation of each vitamin includes key words, case studies, and coverage of the metabolic functions of appropriate vitamins. The readability of this complex content is highly regarded by students, instructors, researchers, and professionals alike. Chapter 1. What Is a Vitamin? 1. Is the List of Vitamins Complete? Gerald F. Combs, Jr. is internationally recognized as a leader in Nutrition, having published widely and conducted research ranging from fundamental studies with cultured cells and animal models to human metabolic and clinical investigations. His specialties include the metabolism and health roles of minerals and vitamins, and the linkages of agriculture and human health in national development. He has published more than 300 scientific papers and reviews and 14 books, and is an Emeritus Professor of Nutrition at Cornell University. James P. McClung, Ph.D., is a nutritional biochemist whose past and current research focuses on micronutrient nutrition at both the basic and applied levels. He has expertise in the areas of iron, selenium, and zinc nutrition. Ongoing experiments in his laboratory include studies investigating the impact of poor iron status on health and performance in both humans and animals. Dr. McClung currently serves on the editorial boards of a number of leading nutrition journals, including Advances in Nutrition and the British Journal of Nutrition. He received his B.S. and M.S. from the University of New Hampshire and his Ph.D. from Cornell University.